The New Horizons mission is very much like a road trip. And thanks to our deputy mission systems engineer, Valerie Mallder, we even have a bumper sticker. As both summer and September end, the weather in Colorado is noticeably changing. And so is the pace and character of mission operations on New Horizons. We're now completing the major commissioning activities for our instrument payload, and beginning to turn our attention to Jupiter: our first planetary flyby target. Over the past two months, our spacecraft and instrument teams have designed, tested, uplinked and run more than 30 separate instrument test and calibration activities. These included imaging instrument calibrations for Ralph and LORRI on celestial targets like Messier Object 7, Jupiter, Uranus and Neptune. These also included Alice UV spectrometer calibrations on ultraviolet stars like y Grus, and PEPSSI and SWAP calibration runs on the solar wind. Some of the data from these runs aren't on the ground yet, but what we have seen looks great. 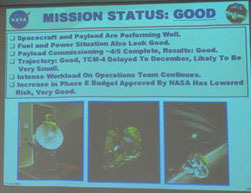 Across the seven-instrument New Horizons payload, everything works well and is meeting spec performance. We were also surprised to experience a planned spacecraft turn on Sept. 4 that sliced the Sun briefly across the open telescopes of Ralph and LORRI. The combination of the planned, high spacecraft turn rate and our great distance from the Sun (then already 3.45 astronomical units) didn't result in any damage we can detect in either instrument, but nonetheless this accident could and should have been prevented by command load checking software. To ensure it never happens again, we've added additional check steps to the mission simulation codes run against every command load before it is sent to New Horizons. These kinds of surprises constituted discoveries about our spacecraft, instruments and ground system that are typical of things space missions learn when stretching their legs early in flight. What lies ahead very soon, however, is a different kind of discovery: scientific discovery at the Jupiter system that we are fast approaching. Planning for our Jupiter encounter has been under way now for almost three years. The highest priority of our Jupiter flyby is, of course, to thread our trajectory through the narrow Pluto gravity assist aim point that lies some 2.5 million kilometers to the right of Jupiter as seen from Earth. We're on a course that'll take us there about a minute late after 13 months in flight, which corresponds to about 1,300 kilometers of aim point error at closest approach. This trajectory residual is small enough that we can choose to either null it out in late December, well before the Feb. 28 Jupiter closest approach date, or wait until we're a few weeks past Jupiter. In either case, the maneuver cost to remove this error will be a kilogram of fuel or less. We'll make a decision in November on when we burn our engines to null out this error. Our second priority at Jupiter is to conduct a series of spacecraft encounter test observations and instrument calibrations, reducing the chance that anything in our Pluto encounter will have to exercise untried capabilities or rely on ground-based instrument calibrations. Over 30 separate instrument and spacecraft sequences are planned, ranging from image motion compensation tests to imager flat field calibrations and stellar occultation test observations. Our third priority at Jupiter is a set of about 100 science observations. These will span a variety of different areas of interest to follow up on discoveries made by ground-based observers and previous spacecraft missions, most notably NASA's Galileo Jupiter orbiter that operated there from 1995 to 2003. Our plans for Jupiter range from some uniquely new studies of Jupiter's rings to compositional and atmospheric observations of Jupiter's Galilean satellites at resolutions that neither the Galileo nor Cassini missions achieved. We'll also study Jupiter's meteorology, its great and little red spots, its magnetosphere and its dust streams. We'll also closely analyze the giant planet's aurora and its link to changes in the Io plasma torus orbiting roughly 420,000 kilometers above Jupiter's equator. The New Horizons Jupiter science observations will begin in early January and stretch into late June, almost four months after we pass Jupiter. This approximately 150-day encounter will mimic our Pluto encounter in length, data volume returned, and operational intensity. All of this, of course, is designed to prove out our planning tools, our simulation capabilities, our spacecraft and our instrument sensors in a real-world encounter environment well before we have to begin planning for the Pluto encounter. Wrapping up most LORRI, PEPSSI, Ralph, and SWAP commissioning activities between Sept. 22-28. Uplinking and activating improved Guidance and Control software to New Horizons on Sept. 29-30. Testing a new, dual-transmitter communications mode (expected to double our future data rates) on Oct. 11. Additional SWAP solar wind calibrations extending across the second half of October. Uplinking and activating improved spacecraft fault detection and recovery ("autonomy subsystem") software on Oct. 30. During these next six weeks we'll also begin designing the Jupiter encounter in detail. This will involve transforming planned instrument observations and spacecraft operations into individual command sequences that will be tested on our spacecraft test beds and ground simulator before being certified for transmission to New Horizons. We've been flying New Horizons for eight months now. Another eight months hence, we'll have the long Jupiter encounter entirely at our back. If all goes well, our spacecraft will be sending down the final Jupiter data by then, and the science team will be preparing its first Jupiter reports for publication. After more than a decade of struggles to fund a Pluto-Kuiper Belt mission and five years getting it designed, built and launched, it's sometimes hard to believe we're really flying it there now. But we are, and the Kuiper Belt's cache of dwarf planets and myriad small wordlets lie ahead. Our vehicle is headed to the place it was meant to be: exploring worlds in the cold, clear, silent vacuum of deep space, far beyond the terrestrial planets, the asteroids, and even the giant planets. So, onward we go on the road to Pluto and its ancient kin, to make a little history, in the warm summer of 2015. I'm headed back to work, so that's all for now. Until next time, keep exploring! 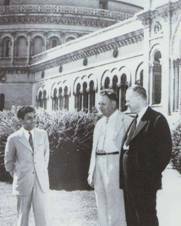 Dr. Gerard Kuiper (center) reveals a different kind of Kuiper belt in this Yerkes Observatory photo taken in the early 1950s. p.s. to Pluto mission fans: The Planetary Society asks me to remind you (and to ask you to remind your friends) that the Nov. 1 deadline for entries to its New Horizons time capsule is rapidly approaching.